Hmm, does that look right to you?? I’m 14,500km in, and it’s been a hell of a trip. But it hasn’t all been fun and games. We’ve spent numerous nights camped on the side of roads, dirty and grimy and in dust pits with the sound of semi trucks jerking us into wakefulness throughout the night. We’ve been cold and wet, hungry and exhausted, and run off the road by awful drivers. 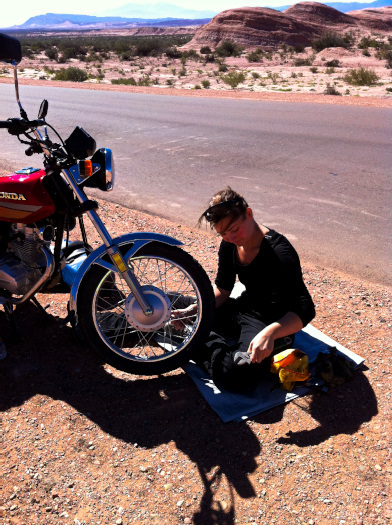 We’ve been stranded in the desert 100km from anywhere, with our first flat tire and the wrong tools. We’ve been chased by packs of savage dogs, and experienced god awful food poisoning. But worst of all, we’ve discovered the phenomenon that is the Argentine municipal campground. We’ve learned that as far as Argentina goes, if it’s a free campground anywhere near a town, we’d rather sleep in a ditch. One evening shortly after leaving Mendoza, after a long and tiring but beautiful ride with strong winds, we found ourselves at a municipal campground near the town of Jachal, north of San Juan. It was dusty, but shady and tree lined, relatively quiet, and free. One family had a speaker blasting the same monotonous beat we’ve been hearing since arriving in the more rural parts of Chile and Argentina, so we went clear to the opposite side of the long grounds, far away from the bathrooms, fireplaces, barbeques and anything else others might be attracted to, and set up camp near a rural little dirt road. Just as we were dozing off, it seemed that everyone and their mom came out to the campground. From cars, motorcycles, screaming de-mufflered scooters, pedestrians, bicycles and even dogs came flying, singing, stomping, tromping, running and sniffing by our tent and “quiet” little dirt road. It was a weekend night and the kids were out to party. With blasting music, honking horns and lots of yelling. All night long. ALL NIGHT LONG! They went back and forth doing “mainies” down the dirt while we tossed and turned, pondering whether or not to put earplugs in. It would possibly help us sleep (or at least quell the rage we were feeling) but it also meant we wouldn’t be as aware of our surroundings, a real safety risk. We dozed fitfully between honks, and Tom finally put in his earplugs. The party continued until 11am (yes, as in, THE NEXT MORNING!! ), and we vowed to be more careful with our choice of campground. Shortly after, outside the town of Chilecito on Ruta 40, we took a deserted dirt road down to a dam where we saw signs for a municipal campground (not realizing the trend just yet). We were happy to find it totally deserted, but just in case, we set up camp at the very end. We were excited at the prospect of a quiet, noiseless night, on a continent where noise seems to rule all- from car horns to bomp bomp bomp music, to blasting tv and late night partying- the noise is everywhere, like a zombie horde you can’t outrun. But here, on a Thursday night, nothing would bother us. So it came as a bit of an unreal shock that at 11pm, just as we turned off our headlamps and settled into our sleeping bags for a wonderfully peaceful night in the countryside, a car rolled down the dirt bomp bomp bomp-ing. Tom was wide awake again and said, “You have got to be kidding me. What’s wrong with these people? !” I thought the comment insensitive and told him so. This was, after all, their area, and they were fairly far away (for Latin American standards, that is, who have a different idea of ‘personal space’). An hour later, many more cars had come and gone, and come again. A distinctly separate group rolled up and decided that out of all the empty camp sites in the area, they would set up their speakers 12 feet from our tent, and start partying at the table just next to ours. I apologized to Tom for telling him the comment was insensitive, unzipped the tent, and made up a story about being sick, and could they please move the party a few camp sites away- por favor. They half drudgingly obliged, and we tried going back to sleep. 15 loud minutes go by, and we hear clapping coming from just a few feet from our tent. I had recently learned that in this part of the world, if you walk into a store and don’t see an attendant, you clap a few times instead of saying “hola?”. Tom shouted something to whoever was clapping, and they responded with, “Do you guys have a cup I could use?” I shout back, “WE ARE SLEEPING!”. But it was the straw that broke the camels back, and at 1:15am, we packed up all our gear, got back on Ruta 40 on a moon lit night, and rode another hour through mountains and gullys before finding a (this time actually deserted) dirt road to camp on. The only sounds we heard were a few horses snuffling and stomping around our tent and wandering off. Wait ’til you get to Colombia, where the speakers are taller than I am. Once, at a cabalgata (a parade of fine horses), every car lining the road had its music blasting, each music different. The poor horses were in a panic. Another time at an empty country park, a family arrived and plunked themselves down so close to us that one friend had to bend her knees to keep her feet from being sat on. I’ve had similar experiences throughout Latin America. In Colombia, I rented a small cabaña on what I thought was a quite and desolate beach. At 1:00 am, a convoy of jeeps and trucks drove onto the beach and parked in front of my cabaña. The thumping bass from their speakers rattled everything within a one-mile radius. They didn’t leave until 4:30 pm, at which time all the roosters began to cocka-doodle-doo. Needless to say, I didn’t get any sleep. The beach was also littered with condoms. Oh my god. Torture. Sheer torture. Did I mention the TVs blaring everywhere, all the time?! I miss the bomp bomp bomping!